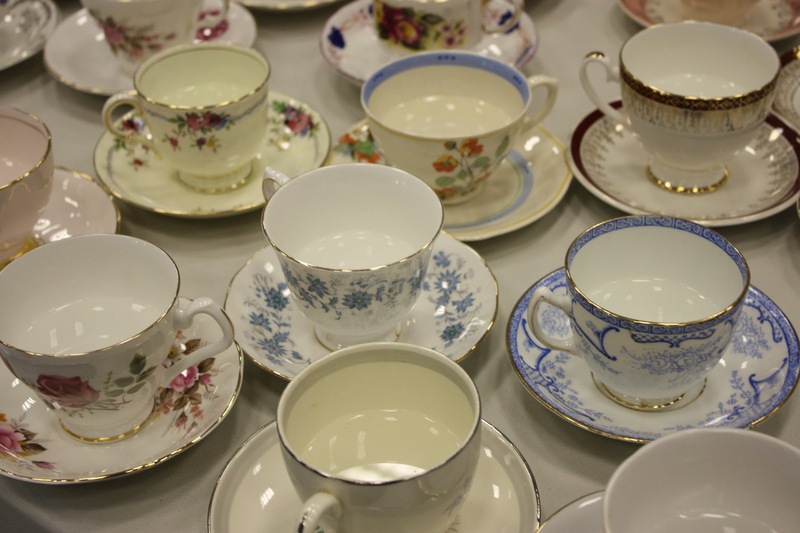 We are excited to introduce a new blog series here at West Weddings. Over the next three weeks we’ll be sharing the stories of real brides who planned gorgeous weddings – on a budget. Yes, we know. The word ‘budget’ is oh-so-taboo in the world of weddings, but the reality is that brides are beginning to realise that they don’t have to break the bank to have a beautiful, personalised wedding that they love! We want these stories to provide inspiration – whether you have a sizeable savings for your wedding, or you’re a bride despairing over what seems like an impossibly small budget. Before we jump into Ruth’s story, we also want to introduce a GIVEAWAY! 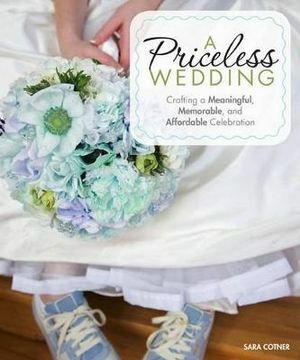 In keeping with our theme, we will be giving away a copy of ‘A Priceless Wedding’ – a must-have wedding planning guide by popular blogger Sara Cotner. This book covers all the must-haves when planning a wedding, from ceremony to reception and everything in between. Sara will guide you through planning your wedding day while making it meaningful, memorable and affordable. Scroll to the end of Ruth’s story to enter yourself in the giveaway drawing. My name is Ruth Cookson and I live and work in Bristol. I got married on the 3rd September 2010, in Newport, to my wonderful husband, Pat! I would say the money was a limitation to our wedding planning, as venues tend to be rather pricey and then everything just adds up. I found this difficult to come to terms with, as I had an idea of how and where I’d like my wedding to be. But as soon as I’d realised such places and ideals were out of our price range, my mind-set changed and I got right on to the budget wedding! Our budget was approximately £6,000. What elements of a wedding were your top priority when you were planning? Obviously my top priority was my wedding dress! I thought I knew exactly what I wanted, but then ended up with something completely different. We also wanted a big venue, as we really wanted a big wedding so that all our friends and family could come, so that was a definite priority. Then I’d say decorations were next! We had an English Country/vintage style wedding, so I got quite obsessed with sewing bunting and collecting tea sets. I knew what I wanted the wedding to look like, so that was definitely a top priority/obsession(!). What was your experience of working on a budget, and what would you tell a bride who is worried that she needs to go into debt (or wait 10 years) to afford the wedding she wants? My advice for working on a budget would be plan out each month what you’re going to pay for. For example, I paid for my dress over 4 months: the same amount each month. Then one month we would pay the florist, caterer, and for the rings. That way we didn’t experience any ‘out of the blue’ costs leaving us short that month and then the next. It can be SO tempting to spend so much on the little things; they really add up, but on the day, all those little things that you saw as super important – well you don’t even notice them! What did you end up spending the least amount of money on? Why did you spend less on this, and how did you manage to keep the cost down? We spent least on our decorations and flowers. 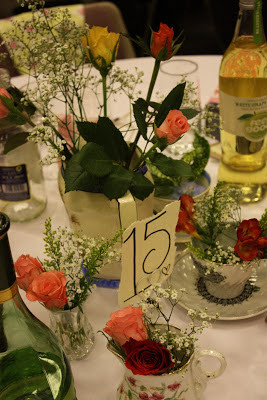 I raided charity shops for vintage tea set/vases for our table decorations. We then went to a florist wholesalers and did our flowers ourselves. Flowers are a HUGE cost and by doing it ourselves saved us a lot. It also made the day even more special as we’d put our own special touch on it. What did you end up spending the most on, and why? What made this a particular spending priority for you? We spent most on food and drink. We had 200 guests so there was nothing we could do to avoid that! 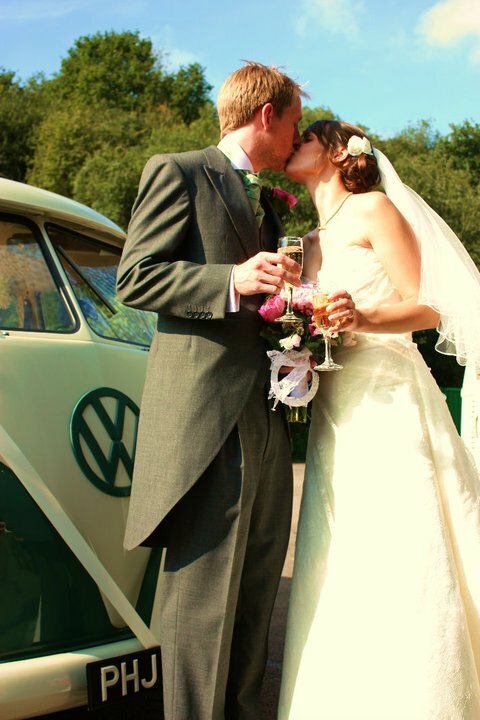 Other than that we spent most on my wedding dress, as I unfortunately fell in love with a rather expensive one! What would you give as your top ‘insider tip’ for throwing a wedding without millions of pounds to spare? Make and do as much as you can yourself. It gives your special day an individual and beautiful touch that everyone will notice and remember. If you are as inspired by Ruth’s story as we are, leave a comment and let us know your top-tip for planning a wedding without spending the world. Doing so just might even earn you an entry for our giveaway! Guild Wedding Fayre THIS Sunday! Best advice for budget-friendly brides is to buy an inexpensive wedding gown- think about white bridesmaids gowns! And guest list! Hi Liz! Due to some unforeseen events which have delayed our continuing our blog series, we've pushed the deadline for the giveaway back until the end of the month – we'll announce the winner then!